Please join us in the beautiful Oregon Coast Range this summer and help restore a piece of Civilian Conservation Corps (CCC) and Siuslaw National Forest history! 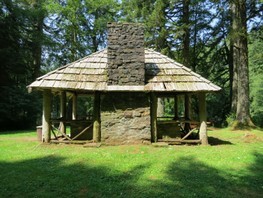 The Hebo Lake Community Kitchen is part of Hebo Lake Campground, which was constructed in 1935-1936 by CCC Company 622. What remains of The Community Kitchen is the last of the original CCC structures present, and is in desperate need of attention. Volunteers working under the guidance of historic preservation specialists from HistoriCorps will help insure that the community kitchen and the Civilian Conservation Corps legacy will be available for future generations to experience. The project promises to be a fun but challenging experience, wherein you will learn new (or hone existing) skills. As an added bonus, the Pacific Ocean is only a short drive away, so please join us for the project, and in those hours "off the clock," enjoy the many recreational opportunities the area provides! See you this summer!